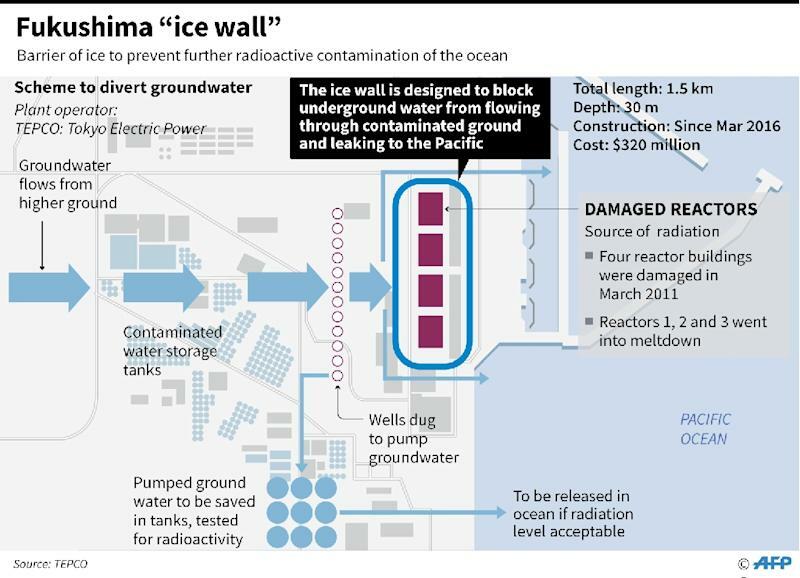 Fukushima's operator on Tuesday started freezing the last section of a $320 million ice wall designed to combat widespread water contamination at the site of the worst nuclear accident in a generation. 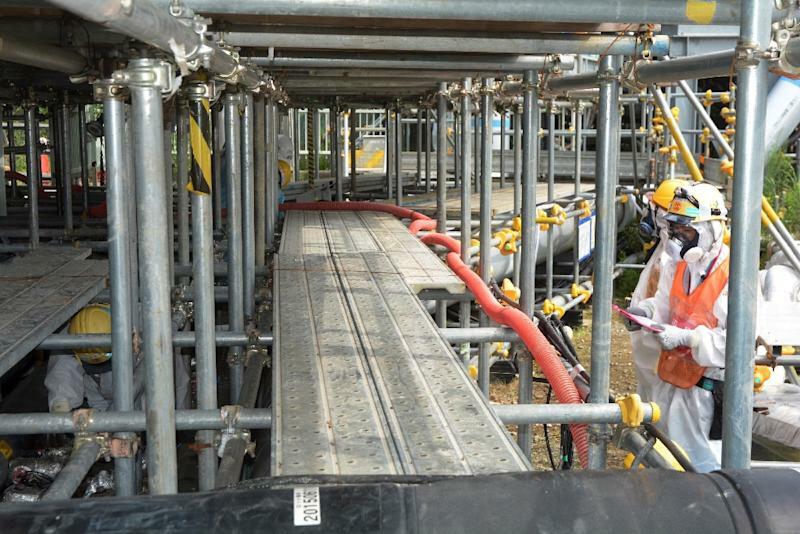 Tokyo Electric Power (TEPCO) began pumping coolant into the remaining seven metres (23 feet) of its 1.5-kilometre underground wall which encircles the four reactors along Japan's northeast coast. Underground pipes circulate the coolant and freeze soil around the buildings. The 30-metre deep wall is designed to block underground water from nearby mountains from flowing into the shattered complex and then seeping into the Pacific. It is reportedly expected to take more than two months until the wall is completely frozen. The huge utility has been building the barrier since March 2016 with the government picking up its 34.5 billion yen ($320 million) price tag. Even now, with the ice wall almost complete, about 140 tonnes of underground water flows into the plant daily, forcing the company to pump it out and store it in on-site tanks. "When the ice wall is completed, we estimate that the amount of underground water flowing into the complex will be less than 100 tonnes," a company spokesman said. But some experts have cast doubt on the ice wall, and the country's Nuclear Regulation Authority said it has not yet done an independent analysis. "We doubt the ice wall is going to be as effective as TEPCO claims it will be," said an NRA official who spoke on condition of anonymity. "We're going to monitor its progress after it is finished to check the impact." In June, the NRA's acting chief Toyoshi Fuketa publicly accused TEPCO of lying about the wall's effectiveness. The same month, three former company executives went on trial, facing the only criminal charges laid in the accident. On March 11, 2011, a magnitude 9.0 undersea earthquake off Japan's northeastern coast sparked a massive tsunami that destroyed entire towns and villages along the Pacific shore, leaving nearly 18,500 people dead or missing. The huge flow of water overwhelmed cooling systems at the Fukushima Daiichi plant, about 220 kilometres (135 miles) northeast of Tokyo, causing meltdowns in three reactors in the worst nuclear disaster since Chernobyl in 1986. Workers had to keep pouring water onto the reactors to prevent the temperature of the nuclear fuel from rising uncontrollably. Storing and treating that radioactive water continues to be a daily struggle with the cleanup expected to take decades. Fukushima's operator is working on a plan to extract highly radioactive fuel -- believed to have broken through pressure vessels to collect at the very bottom of the reactors -- in a major step towards decommissioning the plant. Radiation spread over a wide area and forced tens of thousands of area residents to evacuate. Some may never be able to go home.